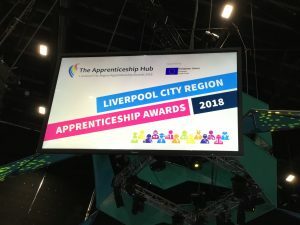 Sefton Council is proud to have received three nominations at the prestigious Liverpool City Region Apprenticeship Awards 2018. 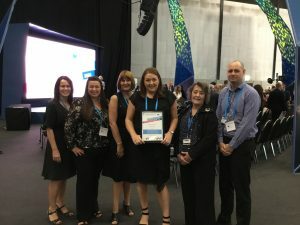 The event, held on June 18 at the Exhibition Centre in Liverpool, celebrated apprenticeships in the Liverpool City Region and recognises the best apprentices and apprentice employers. 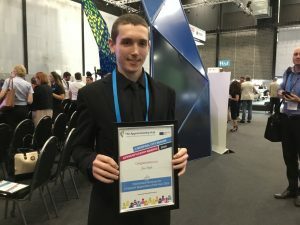 The awards were organised by Liverpool City Region Apprenticeship Hub and were a part of the Liverpool City Region Skills Show. This is a free one day event for residents to meet local employers, apprenticeship providers, colleges and universities. 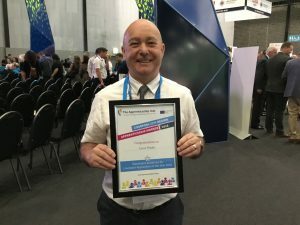 After a high level of applications, Sefton Council was recognised for its dedication to recruiting apprentices, with its nomination in the Sefton Apprenticeship of the Year section. Jon Boyle, 23, and Ernest Brookes, 57, are apprentices currently working at Sefton Council and were both nominated for Liverpool Apprentice of the Year. Jon has become a strong member of the team at Crosby Lakeside Adventure Centre while Ernest joined the Council to test, develop and roll-out the new provider portal to nursing and residential care providers. Attending the awards, Cllr Paulette Lappin, Cabinet Member for Regulatory, Compliance and Corporate Services, said: “Congratulations to our two apprentices for receiving their nominations in a very tough category. It is very well deserved and we commend both Jon and Ernest for all their hard work. Training Provider, Asset Training Consultancy, worked closely with Jon to help him secure an apprenticeship with Sefton Council. By undertaking a variety of tasks such as security, health and safety and dealing with staffing issues, Jon has built the confidence and knowledge and believes that the support received has given him the confidence to follow his chosen career. Having left school without any qualifications, Ernest feels he’s made great strides by starting his apprenticeship. He has been a key figure in the implementation of a cost saving provider portal and he is now ready to take on more responsibilities. Ernest also worked with Asset Training Consultancy to gain his apprenticeship with Sefton Council. With the help of a dedicated Corporate Apprenticeship team, Sefton Council takes on an average around 60 apprentices per year. The programme includes monitoring and supporting apprentices on their journey whilst enabling them to make the most of their skills and gaining valuable experience. Businesses and professionals will be looking to the future at a popular event being hosted by Invest Sefton, Sefton Council’s enterprise, business support and inward investment service. The Forum will be chaired by Kevin Murphy, Director of Rent A Space, a Sefton based business. The Growth Hub Marketplace following the Forum will provide an opportunity for businesses to browse a range of funded support available to businesses from Sefton Council and the wider Liverpool City Region. “Sefton is very much open for business and ready for the future, and Sefton Council has an important role in facilitating that growth. “One way we can help is to expose local businesses to vital experience and expertise, as well as signposting them to funding opportunities to help their businesses grow and in turn, create employment opportunities in the borough. Absolute Bowie presents a brand new stage show at The Atkinson on Saturday 19 May, 7.30pm. “50 Years of Bowie” is a musical journey through the iconic singer’s ever changing personas this May at The Atkinson. David Bowie’s evolving image has mesmerised fans since the early 70’s and for the first time ever Absolute Bowie takes the audience on a trip presenting all his best-loved personas in all their glory. Performed by a world class five-piece band (six with added saxophone! ), this brand new and unique concert features three sets and more costume changes than any other show. A true extravaganza of the wonder that is Bowie’s work. “Absolutely wicked. As one who was there, watching AB put me back there again. For anyone who missed it or fans who want to relive it I definitely recommend it. As close to the real thing that you’ll get. Enjoy.” – Woody Woodmansey (Spiders from Mars). All of the Starman’s greatest hits are performed plus the band perform tracks from the albums David Bowie, Ziggy Stardust & The Spiders From Mars, Heroes, Aladdin Sane, Hunky Dory and Young Americans through to Heathen, Outside, Reality, Earthling and Blackstar. Featuring the incredible vocals of John O’Neill as David Bowie, with Chris Buratti on guitar, Fabio Cashio on bass, Alex Paollilo on keyboards, Alessandro Ricardi on drums and Fiona Asbury on saxophone. The band have toured the UK and Europe for the past 9 years performing the hits of Bowie with their energetic (and theatrical!) stage show and look to take things to the highest level with this huge new show. Prepare to be taken from A to Z (Absolute Beginners to Ziggy!) with Stations to Station in between. Tickets are on sale now £18.50 / £22 doors and available online at https://www.theatkinson.co.uk/events/absolute-bowie/ via the Box Office on 01704 533333 and over the counter during opening hours. Join the mailing list online and stay up to date with the events, activities and exhibitions coming up at The Atkinson. Plus receive offers! The Night Before Christmas at The Atkinson. This festive season, The Atkinson offers families the perfect Christmas treat! On the night before Christmas, Emily stares out of the window, hugs her teddy and waits excitedly for the morning, while in the corner a little mouse called Eddie can’t understand why only humans are allowed to get presents. So he sets off in search of Father Christmas to find out for himself. Along the way he dodges the family cat, gets directions from a cowardly robot and is given some unexpected advice from the magical fairy on top of the tree. Will Eddie get an answer? Will Emily get her wish? And what is that funny-shaped present sitting under the tree??? The Night Before Christmas is the latest production from Big Wooden Horse, creators of the hit shows Don’t Let the Pigeon Drive the Bus!, The Way Back Home, Monstersaurus and Aliens Love Underpants. The Night Before Christmas runs at The Atkinson from Wednesday 13 – Sunday 17 December. Tickets are £12. To book tickets please call box office on 01704 533333 or book online at theatkinson.co.uk. Counter sales are also available during opening hours. Sign up to our e-newsletter and find out about the events and activities coming to the venue first, as well as receiving special offers on tickets! The NHS Health Check programme is a national programme designed to identify early signs of heart disease, stroke, kidney disease, type 2-diabetes or dementia and to help find ways for individuals to lower their risk. Local authorities across England are required to provide local Health Checks for all eligible patients aged 40-74 who are not known to have a long term condition. We want to hear from local residents and Patient Participation Groups (PPG), and will use feedback to improve the service. Closing date for this survey is the end of November 2017. Fill in the survey here.